Rose of Arden: Pimp my ride! Like all young men, I customised my first car - I had a green Morris 1000 which I fitted an 1100 engine into. I painted on a couple of go faster white stripes, added one or two stickers and a drivers window overtaking mirror. That level of customisation made my car stand out in the crowd. It did nothing for improving the type and quality of crumpet made available. Disappointed, that was the end of my interest in pimping up my ride. At the same time I always had an interest in motorcycles and quite a few passed through my hands over the years. There was always pillion crumpet available - but a bike comes a poor second to a cars backseat every time. Now I am at an age (second childhood) when I might just consider pimping my ride once again - however this time I might target a more suitable vehicle. You can imaging my amazement to find out that someone had beaten me to tricking up a mobility scooter. It seems that a "supercharged" mobility scooter has been seized from a member of the public by Doncaster Council. Apparently it had been observed being driven at speeds of up to 60mph, scaring wild deer and annoying residents in the area. Cynthia Ransome, Doncaster council's communities officer said "The mobility scooter had been converted to be driven by a supercharged 140cc petrol engine and had been "pimped" with go-kart wheels and a large bore exhaust." She added "Whilst it may look like a lot of fun to ride, this type of noisy vehicle annoys residents immensely and terrifies local wildlife and walkers. We don't want to stop people having fun and this is obviously quite a feat of engineering, but when they build machines like this they should be used at licensed tracks and not in areas where they annoy others." But being beaten to the draw on pimping up my ride was one thing - further disappointment came when I found out that someone had pimped up the fastest mobility scooter in the world. Colin Furze, 31, spent nearly three months converting the mobility scooter by fitting a powerful 125cc engine complete with five gears and twin exhausts. The petrol heads super scooter, which is pained a suitable shade of British racing green, can reach the national speed limit. It would be able to keep up with cars on the motorway. Colin, from Stamford, Lincolnshire said "It is quite scary when I'm driving it fast as the frame is pretty flimsy and designed for going along at slow speeds. You can't take your eyes off the road when driving it as any rash steering decisions could make it flip over and the slightest dip or bump in the road makes it drift off course." Colin decided to transform the scooter after he was given the machine by a friend. 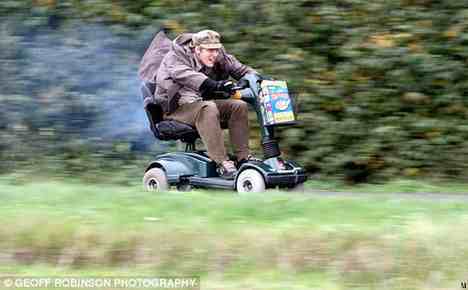 He was determined to build the fastest mobility scooter in the world and applied to Guinness to set the record as there wasn't one already in place. I think that most of my readers know that I have a bit more than a passing interest in Bats. I had decided to pimp my ride by emulating the Bat Mobile. You can imaging the bitter disappointment when I found out that I had been beaten to the punch once again. Brian Vann spent weeks transforming his mobility scooter into superhero Batman's bat car. He can be seen riding the Bat mobile, around Gotham City – the sheltered housing complex where he lives in Evesham, Worcestershire. Brian a retired construction worker said "People drive past in their cars and stop when they see me and ask for a photo. I feel like a bit of a celebrity. 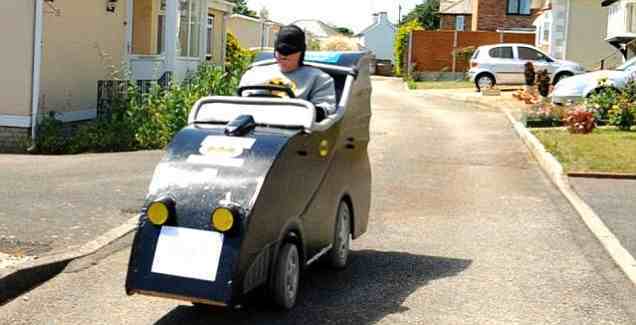 I know how the Beckhams must feel when I go out in my Batmobile. If it brings a smile to people’s faces, then it’s done the job." Colin has already started work on another design which will transform his mobility scooter into a Thunderbird spaceship. So it looks like it will be my narrow-boat that I pimp-up after all. Damn - someone had already done a U-Boat! Resembling one of the feared attack vessels that sank 3,000 Allied ships during the Second World War. Kitted out with with torpedo tubes and a periscope. 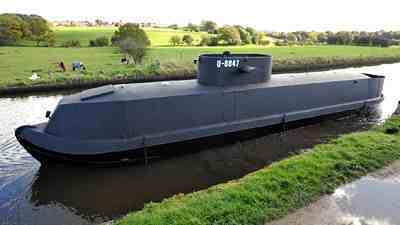 The U-Boat launched on the Leeds-Liverpool canal at Botany Bay in Lancashire. The owner Cyril Howarth from Chorley said "It is the culmination of a 12-month dream. I have always studied naval history, in particular the role of the submarine. You should have seen the faces of the locals when they woke up and found a battleship-grey German navy U-boat in their midst."